The New York newspapermen dubbed Joe Dawson "The Indiana Whirlwind" after the 21-year-old stormed to the front of the 1910 Vanderbilt Cup with something less than 50 miles remaining to the finish. His primary rival was the deliberate tactician Harry Grant back to defend his title of the previous year with his awe-inspiring "Black Beast" ALCO racer. 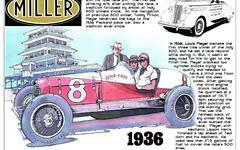 The young Hoosier, driving the lowest horsepower racer in the contest, an Indianapolis-built Marmon, appeared to have matters under control. The problem was Long Island, New York's Vanderbilt Cup was never, ever under control. From its debut in 1904 massive crowds swarmed the public roads briefly appropriated as a race track. Vendors even sold "ticklers" - sticks with feathers attached - so people could attempt to brush the drivers speeding by at nearly 100 miles per hour in their massive, brakeless 2,000-pound iron and wood behemoth cars. Most of these early races attracted hundreds of thousands of spectators from nearby New York City and many simply could not resist running across or onto the racing surface - even as cars approached. So it was for Joe Dawson who struck a man when he inexplicably cast himself in harm's way. Distraught and with a leaking radiator young Joe stopped at the Marmon pit as soon as he could. With over 500 miles of telephone wires networking far points of the 12.5-mile course his crew had received word that the spectator, while injured, would recover. They coaxed their distraught driver to return to the fray as soon as they patched the radiator. He did, and with a flourish that earned him his nickname. Grant, though, had gained too much time and beat Dawson to the line with a 25-second advantage. Dawson, who lived in Indianapolis with his parents at 2828 Illinois Avenue, was a Marmon employee, as was his father who secured him his job. Joe was a mechanic and test driver. The job description included racing company products in competition and he loved it. The grainy image posted here is of Joe at the wheel of another Marmon at the Memorial Day weekend of racing at the Indianapolis Motor Speedway in its first major event after transforming into the beloved "Brickyard." Joe was one of the top drivers of the meet, winning a sprint race and leading in the first day's feature, the Prest-O-Lite Trophy until mechanical trouble dashed his quest. There is no place in the physical world or online you can go to find more information about this important driver than First Super Speedway. No place, period. Dare to click thru the links you find here. Go on, you will learn and be entertained.